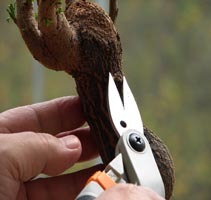 The main objective of trimming and pruning is to shape the bonsai into the desired form and to reduce growth above ground in order to maintain a balance with root growth. The process of shaping begins when the tree is very young and is on-going as it continues its growth. Trimming is accomplished by using a sharp scissors or shears. This traditional tool is called butterfly shears or bonsai shears and is used for removing foliage and light branches. When heavier branches are removed, we call it pruning and the tool to use is the concave cutter, for which there is no substitute. The concave cutter allows you to remove small, medium and even large branches without leaving any visible scars. Some trees such as the Juniper should be trimmed by using the thumb and index finger to remove new growth and to prevent browning and a "sheared" appearance. In the growing months (typically spring and summer) you will see new growth at the tips of the branches. It is up to you to decide if you want to trim or prune the new growth. Decide if it suits the style you are going for.